Promoting Penn State University and the Penn State Alumni Association by providing fellowship, philanthropy, and support to alumni and friends in the Triangle area of North Carolina. The Chapter’s Durham Bulls game always draws a big crowd, and this year will be no exception. We’ve partnered with other Big Ten Alumni groups to join the Bullsf or one of their biggest promotional nights of the and promises to be tons of fun. Game time against the Gwinnett Stripers is 6:30pm, with gates opening at 5:30pm. Our groups will be in the large pavilion on the third base side under the overhang, so we’re out of the sun (and any precipitation). Ticket price ($29.25) includes a two hour all-you-can-eat buffet starting at 6:00pm, and kids under five are free (but won’t get their own seat, so if you don’t want your kid on your lap all game, you can purchase a ticket for them as well). The 2019 Annual Spring Report can be found here. View the PDF version here. This year, the Triangle Chapter was proud to present its second annual Chuck Darran Member of the Year Award to Dan Stahlman. Dan is one of the longest serving members of the Triangle Chapter, joining the Chapter and its Board in 1992. 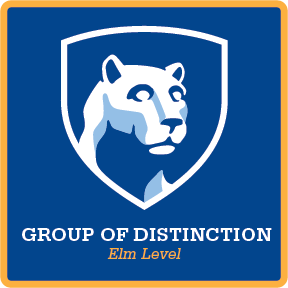 The Triangle Chapter is proud to announce that our Chapter has been recognized for the fifth consecutive year as a 2017-2018 Elm Level Group of Distinction by the Penn State Alumni Association! THANK YOU to everyone who donated to THON 2018 through our chapter.